"As you may have heard, an AIG collapse is imminent and would cause a catastrophic global economic depression. In order to stave off such a catastrophic event AIG needs $20 Billion in capital. 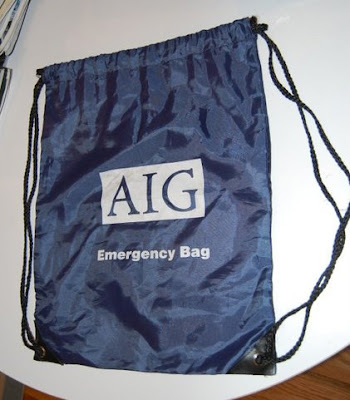 Therefore, to rescue the world from this debacle, I am auctioning off this authentic AIG Emergency Bag in hopes of raising the required $40 Billion. 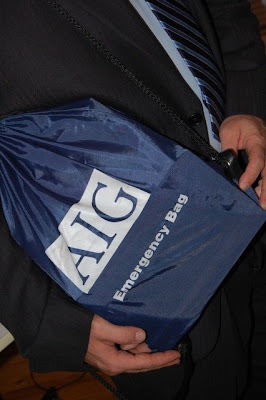 This very stylish bag can be used as a backpack during both emergency and non-emergency situations and can hold up to $75 Billion (must use really large denomination bills) which is exactly the amount needed to salvage AIG from ruin. Although not photographed here, the bag comes with a pair of goggles and a gas mask issued to me on orientation day at AIG. The gas mask is unused, however I did put the goggles on a few times and run around the office (Christmas parties, Wednesdays, things like that)." In real news- The Government is Bailing out AIG for $75 Billion.